Sulfate free - Organic conditioner coconut. A miracle hair care product, essential for healthy, smooth and shiny hair!Its exotic fragrance with a touch of coconut takes you away! 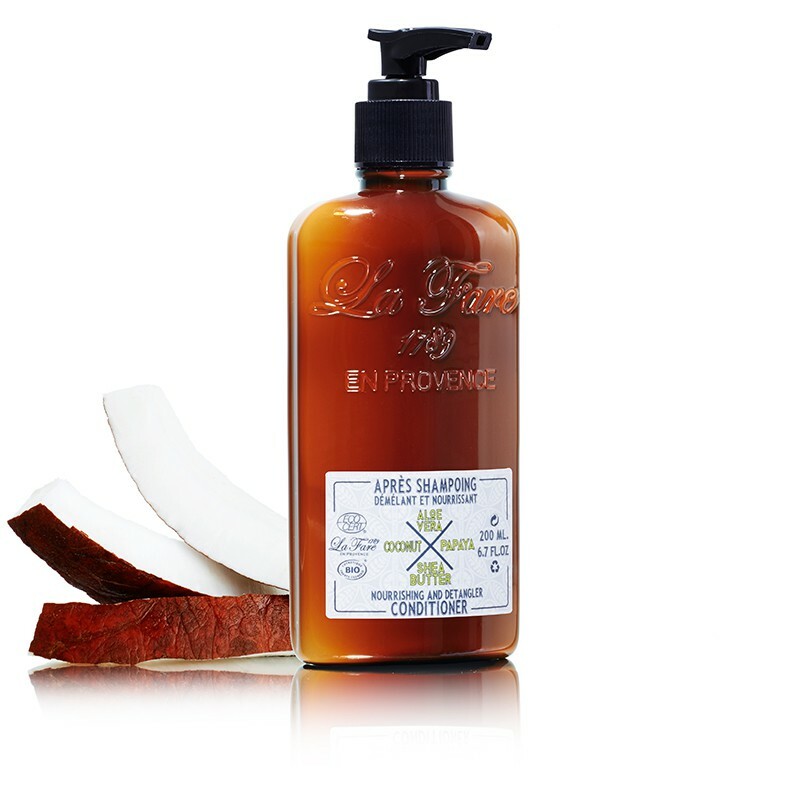 An amazing combination of organic ingredients: Aloe Vera restores radiance and slow down hair loss, Papaya moisturizes, smoothes and detangles hair, Shea Butter deeply nourrishes, and Coconut stimulates hair growth for beautiful healthy hair. Apply on wet hair after shampooing over the lengths and ends. Wait for 2 minutes, rinse well and voila! Immediate results! Break time : 2 to 5 minutes. Using Advice : after the shampoo to damp hair, apply to lengths and ends. Leave for 2-5 minutes. Rinse. More : la Papaye stimule la repousse du cheveu. INGREDIENTS : AQUA (WATER) - ALOE BARBADENSIS LEAF JUICE** - GLYCERYL STEARATE - GLYCERIN - COCOS NUCIFERA (COCONUT) OIL** - CAPRYLIC/CAPRIC TRIGLYCERIDE - BUTYROSPERMUM PARKII (SHEA) BUTTER EXTRACT** - INULIN - CHONDRUS CRISPUS (CARRAGEENAN) POWDER - SODIUM STEAROYL GLUTAMATE - CETEARYL ALCOHOL - PARFUM (FRAGRANCE) - BENZYL ALCOHOL - CITRIC ACID - DECYL GLUCOSIDE - DEHYDROACETIC ACID - SODIUM HYDROXIDE - BENZOIC ACID - SORBIC ACID - MELILOTUS OFFICINALIS EXTRACT - CARICA PAPAYA (PAPAYA) FRUIT EXTRACT - POTASSIUM SORBATE - COUMARIN - BENZYL ALCOHOL - LIMONENE. Un effet immédiat!! J'adore, je le compléterais plus tard avec le shampoing.